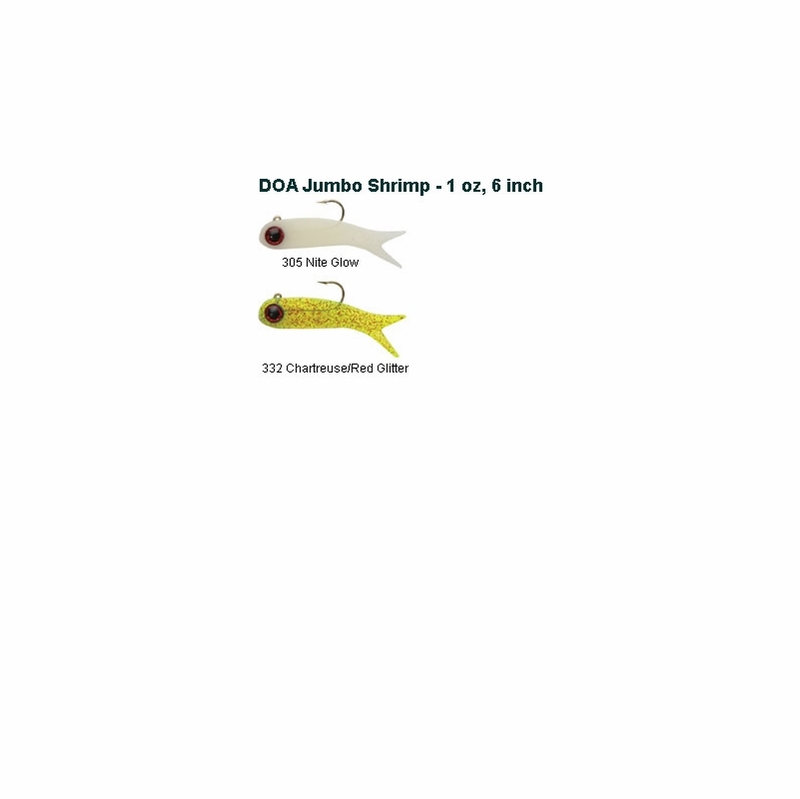 DOA Shrimp Lures have successfully fooled almost every species of fish that feed on live shrimp. DOA Shrimp have a live shrimp look and swimming action. 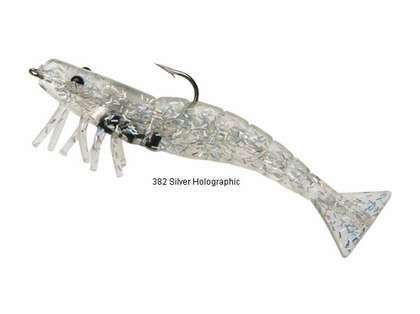 With their downward facing, vibration legs and consistent level drop rate DOA Shrimp Lures have successfully fooled almost every species of fish that feed on live shrimp. Just to name a few, DOA Shrimp have caught trout, snook, redfish, flounder, tarpon, ladyfish, jacks, sheepshead, large & small mouth bass. Fishermen need only to present the lures with a natural slow retrieve to be insured of many memorable days on the water. One of the most important things is to use a loop knot when tying the shrimp to your leader. Your leader should be about 24� long - either 25 or 30 lb test. The loop knot allows the lure to swim freely and it will look more enticing to a fish that is eyeing it for a quick meal. If you can use either 8 to 14 lb test line on your reel, using light line enables you to feel a fish strike your lure a lot better than if you were using a heavier line. A 1/4 oz. Shrimp is recommended for line up to 8 lb test and 1/2 oz. Shrimp for 14 lb test and over. Tying your line to your leader directly without the use of a swivel is best. If you want to use a swivel, use the lightest one you can. Cast the shrimp out and let it slowly sink to the bottom. Then take the slack our of your line. When the slack is out of your line, move the shrimp as slowly as you possibly can. The key word is SLOWLY. If you are fishing in shallow grass, by holding your rod up high this allows the shrimp to be moved across the top of the grass in an upward motion and should allow the shrimp to swim across the top of the grass. After you move the shrimp about 12 inches, which on most reels is about 1 or 2 turns of the handle, give the rod a very slight sharp twitch. You want to make the shrimp do a little flicking motion, just as a live shrimp would do. I love fishing with the DOA chartruse half once shrimp , Its my favorite soft bait, I"ve caught spotted sea trout, redfish , snook , blue fish, jacks, flounder, ladyfish, cobia,barracuda, blue runners, blowfish, sheephead, remoras, snappers all on the DOA, If the fish are there its my first choice to use. I have yet to use it, but how can it NOT catch fish? Everyone raves about these baits. They are very realistic. 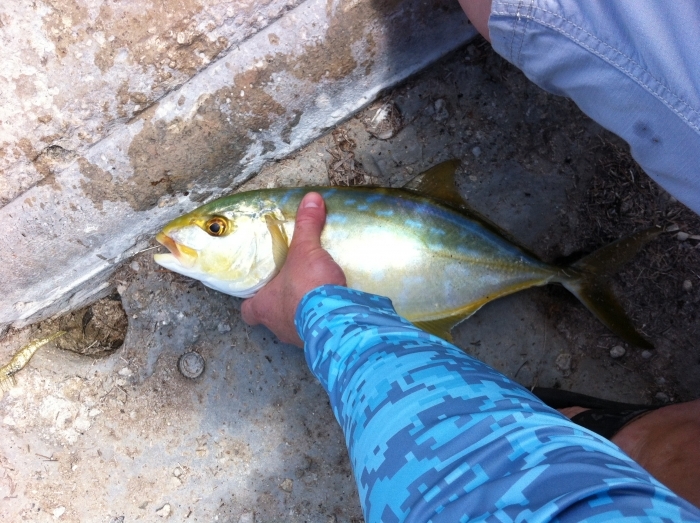 Killer for Snook in the surf! 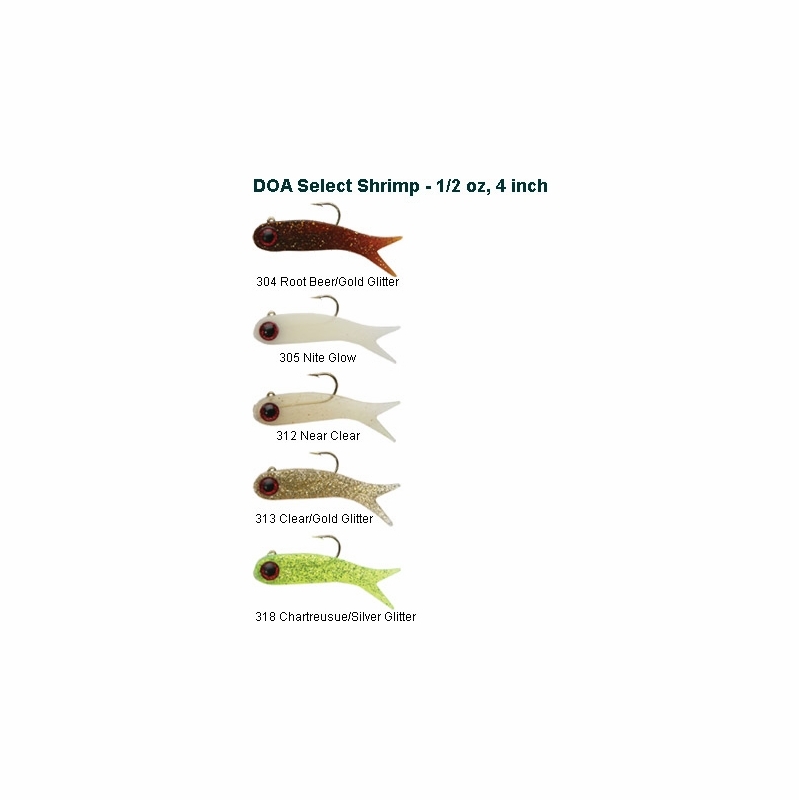 We use the DOA shrimp in all colors to crush Snook in the surf on the Space Coast. Definitely my go-to lures! My family spends a lot of time on the Space Coast each year and we love surf fishing for Snook. On the calm days, this works perfectly while bouncing slowly through the first trough. Snook can�€™t resist! 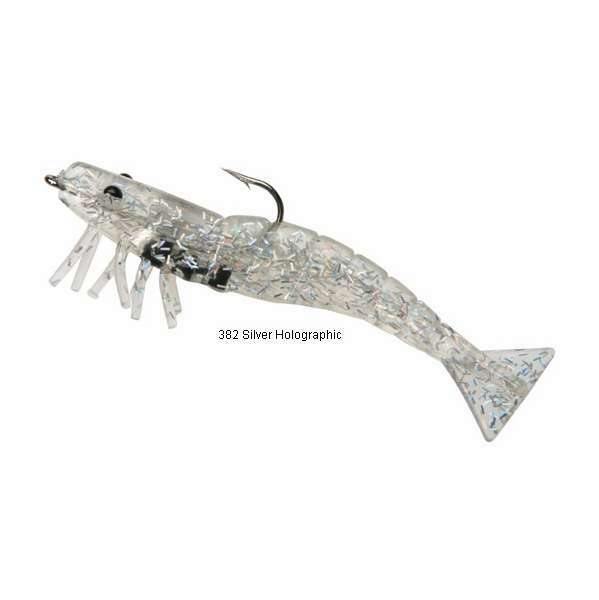 Great for Trout, Reds, and Snook!!! These shrimp are one of the most versatile on the market. You can pitch this any where and catch fish. Little on the pricey side, but spend the money for great results. 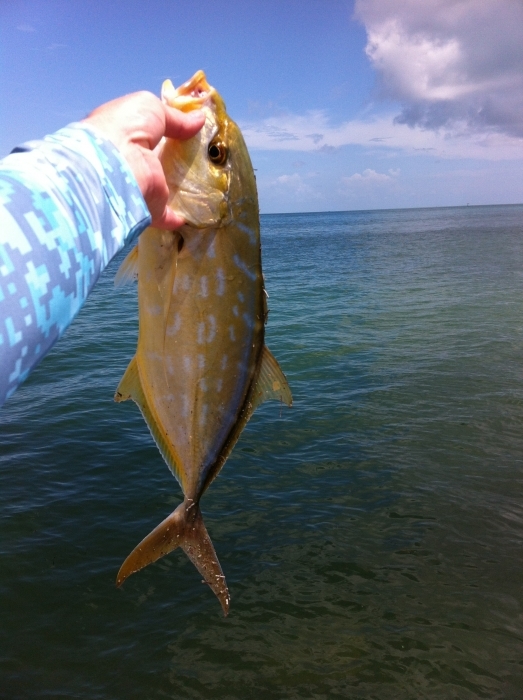 You need to work it slow to get bites..
Used this lure in the Keys & caught alot of Yellowjacks with gold glitter color. Caught a few nice slot reds on these just free lining them or using a cork. They're supposedly made of shrimp bits so that's probably why they work so well! They're pricey but that's b/c they work! Caught many bull reds with this little shrimp. Awesome bait! Works well for fluke and even snook.. all kind of fish.. 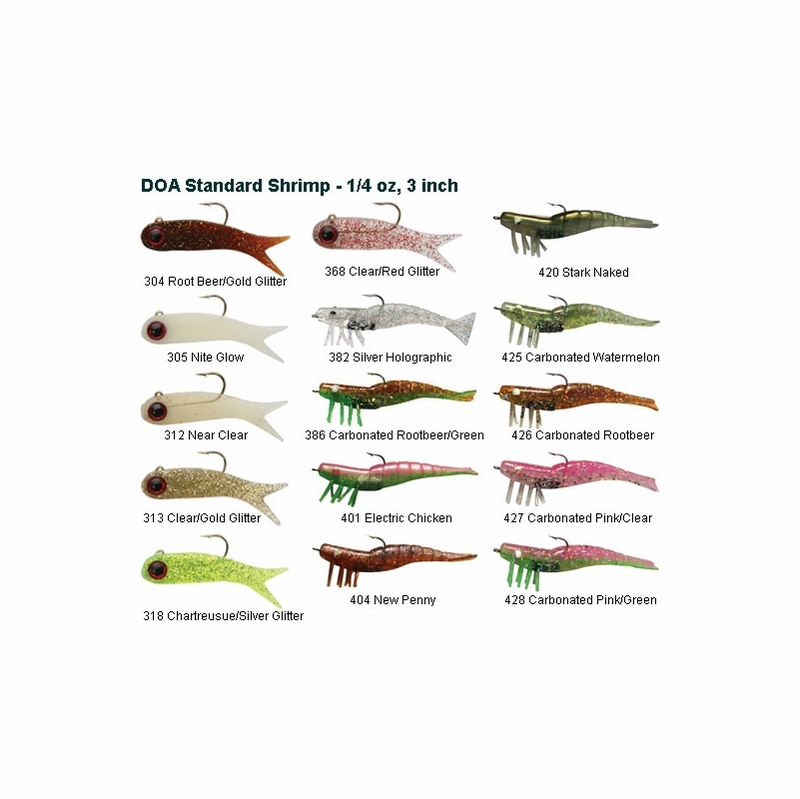 I would like to purchase the larger doa shrimp in avacado red but can't find that color. I buy the smaller ones at the bait stores in avacado red. Is it available? Does this lure come with the weights & hooks? Yes, these DOA Shrimp Lures are weighted by 1/4oz, 1/2oz, and 1oz as well as come rigged with hooks. Yes we do! Shipping costs are shown right in the shopping cart using our shipping calculator before you check-out. We offer USPS, UPS, FedEx and DHL for your convenience.